Skidmore, Owings & Merrill (SOM), the Chicago-based architectural firm behind the world's tallest building Burj Khalifa, has unveiled the design of Burj Jumeira, an aerodynamic, 550-m tower located in the Al Sufouh area of the popular Jumeirah neighbourhood of Dubai. The skyscraper will be one of the tallest buildings in the world. The first phase of the project will be completed in 2023. Located directly between the iconic Burj Al Arab Jumeirah hotel and the Sheikh Zayed Road, Burj Jumeira will become the new focal point in the Dubai skyline and in the Jumeirah neighbourhood. Its upper stories will feature world-class dining, active programming, and multiple observation decks with 360 degree views of Dubai, said the statement from SOM. A reflecting pool at the base of the tower has been designed for reconfiguration into a staging structure, which will provide a premier space to host cultural events. At the periphery of the tower, a new retail destination will seamlessly flow into the surrounding neighborhood, it added. One of the leading architecture, interior design, engineering, and urban planning firms in the world, SOM said HH Sheikh Mohammed bin Rashid Al Maktoum, Vice President and Prime Minister of the UAE, and Ruler of Dubai, had recently unveiled the skyscraper project. "Burj Jumeira is bold, elegant, and dynamic," remarked SOM Design Partner Mustafa Abadan. “It will tower over Jumeirah as the centerpiece of the neighborhood, and will feature a synthesized architectural and structural design,” he noted. 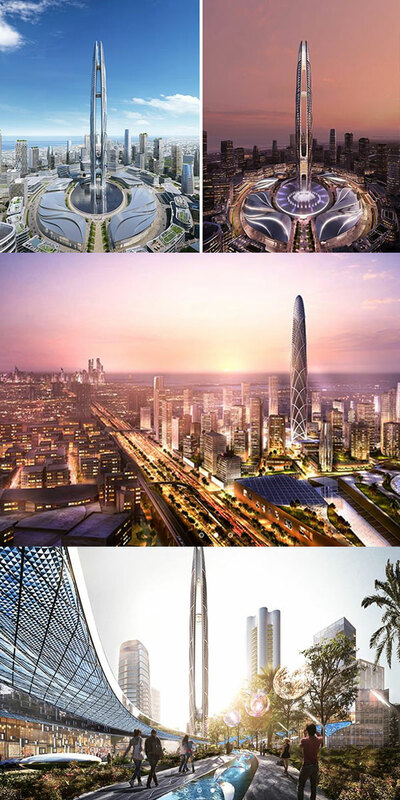 Burj Jumeira’s impressive height and unique, bifurcated shape were made possible by a collaborative design approach, led out of SOM’s New York office, he added. Abadan said the building’s high-performance architectural and structural design are integrated into a singular expression. "The geometry of the exterior bracing is optimised to strengthen the tower against lateral forces and the building’s form aerodynamically mitigates the wind loads. A panelised metal facade system seamlessly blends into the structural system, and the central void creates the space for Burj Jumeira’s panoramic views," he explained. "The tower’s flowing design emulates the regional dunes and oases of the UAE, while its spherical observation deck is evocative of the native gulf pearl," he noted. In addition to providing architectural and structural services for Burj Jumeira, SOM is also designing the master plan for the surrounding Downtown Jumeira, he said. According to him, the tower will be the centerpiece of this new urban district: a highly walkable, mixed-use community that will include residential, commercial, and hospitality functions.